Last week Apache Camel 2.11 was released. This blog post is a summary of the most noticeable new features and improvements. 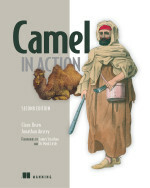 For a detailed description, see the Camel 2.11 release notes. As usual each new release contains a number of new components, contributed by our large user base. Thanks guys. For example there is camel-cmis which allows to integrate with content management systems, such as Alfresco, or any of the systems supported by Apache Chemistry, which is what we use in camel-cmis. We also got a new camel-couchdb for integrating with our fellow Apache CouchDB project. Also very exiting is the new camel-elasticsearch component, to integrate with the excellent elastichsearch project. 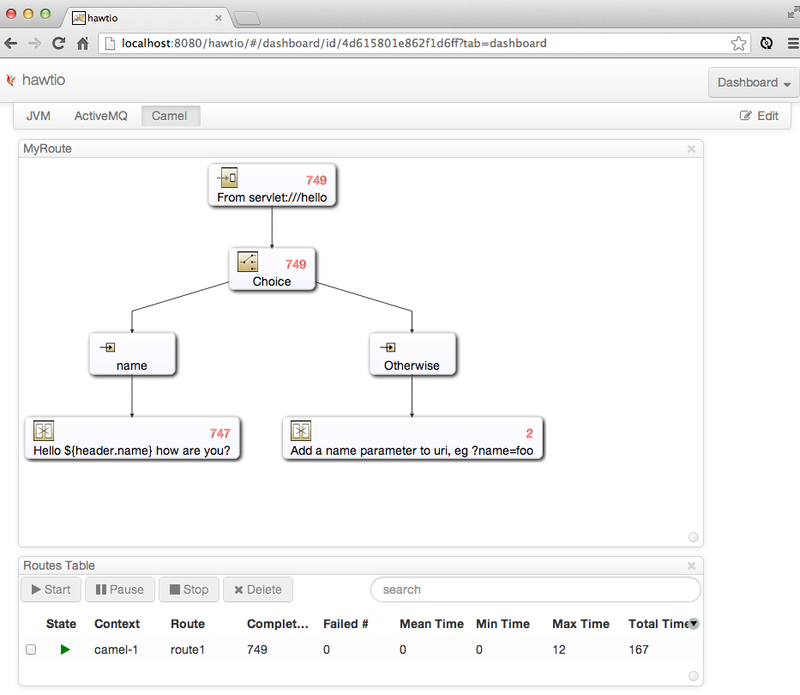 In the hawt new project hawtio we are also working on some great new stuff with elastichsearch around log aggregation and analytics, with a shiny HTML5 graphical user interface using Kibana. If you haven't see hawtio yet, then make sure to check it out. Then James Strachan created the new camel-rx component, for integrating Camel beautifully, as Eric Maijer said, with the fantastic Netflix port of Reative Extensions (RX) library. And when we got Java8 as well, this is going to rock. Then I created the new camel-servletlistener component to allow bootstrapping Apache Camel applications in web applications with no other dependencies. Usually people would need to use Spring or other library to do this. To demonstrate this in example, we have a new servlet-tomcat-no-spring example. As well my blog entry - Camel web applications without Spring, earlier this year about this new functionality. For the upcoming Camel 2.12 we will work on an alternative example using the new blueprint-web module that allows Spring XML like configurations but with only two JARs as dependencies (blueprint-noosgi, blueprint-web). This works beautifully, and we already use it hawtio project to easily bootstrap hawtio web application from a blueprint XML file. Scott Sullivan stepped up and created the new camel-sjms component for a light-weight JMS component which only depends on the JMS API. This component is expected to be further improved and hardened in the upcoming releases. The camel-sjms component is not a 1 to 1 replacement for the existing camel-jms component. They are two independent components. We want the freedom in camel-sjms to implement the functionality we think is best needed, and as well to avoid the many many options that Spring JMS exposes, and hence creeped into camel-jms as well. We also have a new component for integration with Redis with the camel-spring-redis component. And last year I created the camel-urlrewrite component, which allows people to do Camel routes for proxying HTTP services with URL rewrites. I have previously blogged about this as well. We also created a new control bus component, which allows you to send messages to a control-bus endpoint to control routes. This may make it easier for people to start/stop their Camel routes. This component is expected to be improved in the future, so you for example can get performance statistics and other information as well. The SQL component has been improved, so you can now consume as well. This allows you to pickup new data from table(s) and route the data in Camel routes. 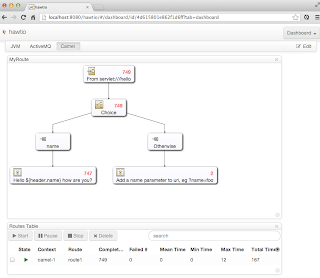 This is best illustrated by the new camel-example-sql that we created. Oh and we also added support for using named parameters in the SQL queries. The Groovy DSL in Camel has been totally overhauled, thanks to community contributions. The DSL is now fully up to date and uses the Groovy'sh style that makes it much more Groovy like. We also added a new Camel Maven Archetype to create a new Camel groovy project. In the earlier phase of development of Camel 2.11 we worked on improving the camel-cdi component. We are not there yet but its a big step in the right direction. We are also waiting a bit for Apache DeltaSpike project to do new releases so we can finish the last pieces. So expect this to be improved in upcoming releases as well. We also worked on improving the camel-netty component to be faster. Most noticeable the netty producer that now pools channels for reuse. For people stuck in XML land and using JAXB, then we made it easier to control namespace prefixes, so you 100% can control the prefix names in use. This allows to conform the XML to a naming style, or if you must use a specific prefix name; usually if a legacy system expects prefix names to be hardcoded. People who are fan of Guice, would be glad to hear we have upgraded camel-guice to use Guice 3.0 as is. The old guicyfruit dependency, which was needed when using Guice 1.x is now gone. We introduced a new backlog tracer, which allows tooling to trace Camel messages at runtime, on-demand. There is new camel-backlog-tracer command(s) for Apache Karaf / ServiceMix, which allows you to trace messages on your running Camel applications at runtime. You can even enable a predicate filter, to only trace matched messages etc. Apache Camel 2.11 now requires OSGi 4.3 and Apache Aries 1.0 if you use the camel-blueprint component. This means that you should use Apache Karaf 2.3 or better as the container. We have improved the startup of Apache Camel a bit, as well the simple language is now faster when invoking OGNL like expressions. And we disabled the type converter utilization statistics as there is a slight performance impact under heavy load. And we managed to let the camel-jms component re-create temporary queues when doing request/reply over JMS with temporary queues, and the connection has been re-connected (eg automatic self-heal). The camel-cxfrs component has a simpler binding, making it easier to use. And as usual we have a ton of bug fixes, minor improvements and new features. See the release notes for full details. Apache Camel 2.11 is available for download from the Apache web site, and Maven users can get it from maven central. The Camel team is now busy working on Apache Camel 2.12, where we have some exiting new work on improved documentations for Camel components. 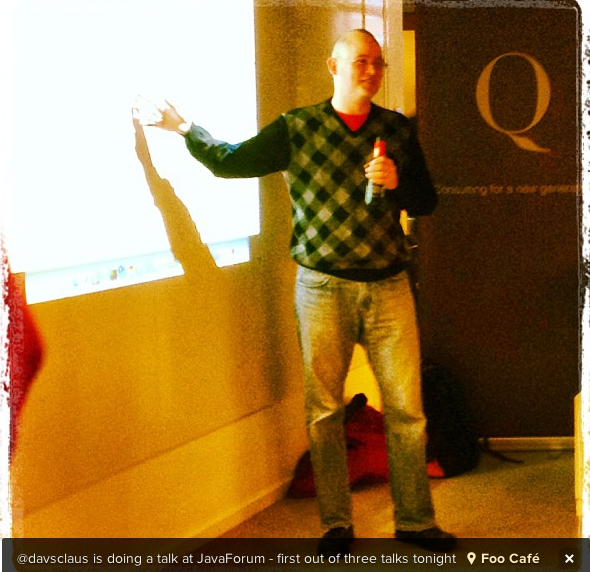 Yesterday I gave an Apache Camel presentation in Copenhagen, at the Javagruppen event. As promised I have uploaded the slides to slideshare, which you can find here. Next stop is a presentation in Gothenburg, Sweden on April 23, and followed by Århus, Denmark on May 7th. And a stop in Odense, Denmark is currently being planned. I previously blogged about upcoming Apache Camel events in Malmo and Copenhagen. I had a great time at the Malmo JUG. And thanks to the beer sponsor TT (Three Towns) we had a great and cosy event. It was my first time giving a presentation with a beer in my hand. I now have confirmation for the event in Copenhagen on April 11th is confirmed and will happen. You can find details about this event, such as location and time, and how to register at JavaGruppens site at this link. My presentation will be in English, and include some live demos as well, so at the end of the day, when you get back, you should be able to get started with Camel yourselves. Nineconsult has been so kind of hosting this event - thanks guys. There is also time for Q and A, so power users of Camel is of course also welcome. We are very keen on hearing your feedback. And discuss the project, and what we can do better, and what lies down the roadmap etc. Also we have time to check out the cool new web console project we are working on as well - hawtio. That is seriously cool stuff. The JUG in Gothenburg have reach out to me, to discuss a Camel event on April 23rd. We are currently working out the details - I will post details when I know more about this event.